The two most important considerations in buying a monitor for trading is the size and the resolution of the screen. The most common size of monitors are 20" through 24" with a resolution of 1600 pixels by 900 pixels (for 20" and 22") or 1920 pixels by 1080 pixels (for 23" or 24"). 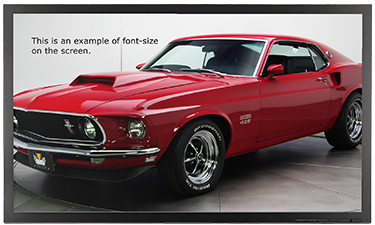 Larger sizes are available, but usually cost more because of the technology required to increase the resolution. For example, some 27" monitors stick with the Full HD resolution of 1920x1080, using larger pixels than their smaller counterparts; other 27" monitors use the same size of pixels, but more of them to gain a higher resolution of 2560x1440. These higher resolutions involve what is called 'Dual Link' and is more expensive. The size is the diagonal measurement of the screen in inches. 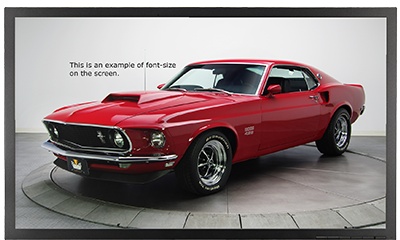 Even if you are on the metric system monitor screens are usually given in inch sizes for the very large US market. The image you see on the screen is composed of over a million tiny pixels. The resolution is how many pixels are on the screen. If you have more pixels, you can see more detail. Compare the second image (left) with the one below. The font-size also changes with the size of the pixels. 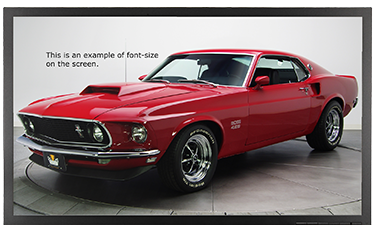 A larger resolution monitor may show text that is too small for some to read. Compare the text on each image (left); the font-size used is larger than what would be typically used but was chosen to demonstrate the difference. As you can see, the text on the 27-inch Full HD monitor is more legible than the 24-inch Full HD. The higher the resolution, the smaller the font. The 4K monitor (bottom image) is the best example of getting too high of a resolution, as the text becomes very small. For traders who use line graphs: the lines are only one pixel wide, so higher resolution monitors will make charts very hard to read. For traders who use candle-stick charts, this isn't a big concern, as the width of the candle sticks can be adjusted. High Definition Televisions (HDTVs) are different than computer monitors. HDTVs supports a maximum resolution of 1920x1080 regardless of the screen size. They will also scale the image provided by the computer and produce an undesireable look. Large monitors (23" to 27") with high resolutions (1920x1080 to 2560x1440) are the most favorable for trading.